Today Sara from Mind Your Mamma is sharing her birth experience. It may have been a back-to-back birth but it was positive experience that made her feel good! I feel really happy to finally be able to write this story, but I also feel a little sad. Not because anything went wrong, but because my baby boy recently turned 8! I’ve wanted to write his birth story since day 1, and yet, it took me 8 years to actually do it. But as they say, it’s better late than never! 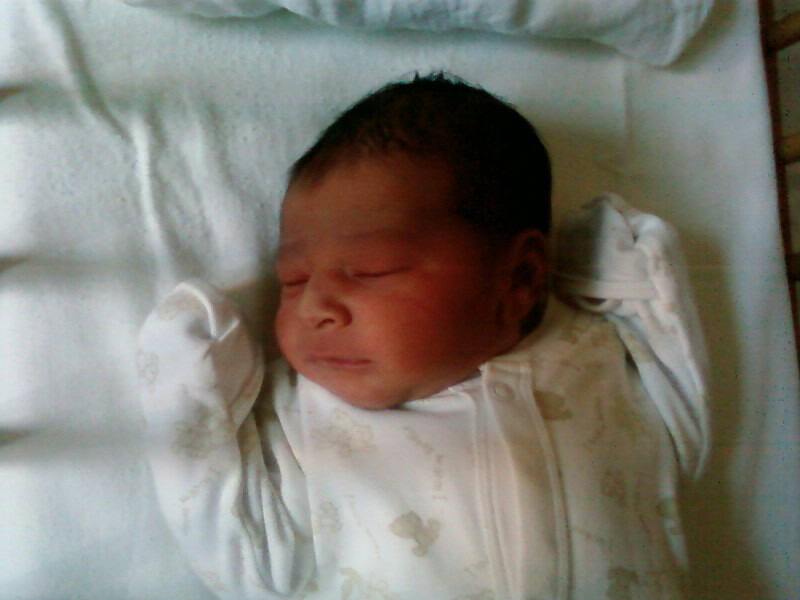 I went into labour on a Wednesday, one day before my due date, in the early hours of the morning. At about 2am I started experiencing mild period-like pains. I got up and noticed I had lost the mucus plug, but I wasn’t sure whether my waters had gone in a bit of a trickle. I phoned the birth centre in the morning, and they asked me to go in to be checked later that afternoon. They didn’t seem to be in any rush at all, so we decided that The Husband was going to go to work, and we’d go to hospital to get checked once he came back. So I had a duvet day. I was still experiencing mild period-like pains, and I was tired from not sleeping at night - a combination of being 9 months pregnant and in the middle of a house move (as people often do when heavily pregnant!) I had just spent the last 4 days back and forth between the house and the old flat, moving the last few things with my mum as best as I could. felt ‘locked’, and neither the GP or the chiropractor were able to fix it. The only thing they could think of is that the baby was now ‘sitting’ on my sciatica nerve. All the more reasons for me not to want to do anything that day. And I remember spending a lovely afternoon going through old photos with my mum. The last day of my life without a child in my arms. At around 4pm, I got up to have a shower and get ready - The Husband would have been home soon. But as soon as I got up and got in the shower, my contractions started. Knowing what I know now about the physiology of birth and about how my body handles labour, things were picking up pace quite nicely and quickly. But I soon became terrified. The contractions felt all of a sudden very painful and very close together. My lower back was in agony, and I didn’t think that labour could be so sudden or progress this quickly. I started resisting it and tensing up. I convinced myself that something was wrong. Instead of a shower, I decided to have a bath, but that was no better. By the time The Husband got home, I was on the stairs waiting for him in tears (my mum had to put my socks and shoes on! ), convinced that something was horribly wrong. Unfortunately, the hospital we were going to wasn’t our local one. It was 6 miles away. I had decided to stay with that hospital after the move as it’s one of the best in London when it comes to maternity care, and it was very close to my workplace. This meant that whilst pregnant I could attend antenatal appointments and classes without too much disruption to my working day. But when you are in labour and feeling terrified, your hospital is 6 miles away, and you leave at 5pm with half of London also leaving the office to try and get home, being in a moving car and for that long really isn’t where you want to be! I hated every minute of it. Every speed bump, every traffic light. Every minute of the hour it took us to get there. 1) I was only 3cm. 2) My baby was back-to- back. At the time I had no idea what that meant, but she explained that my baby had to turn whilst descending into the birth canal, and that’s why I was feeling so much pressure on my lower back. “Go back home”, she said. “Try having a bath and come back later”. Did she know how horrible being in that car was??? I wasn’t going back home. No way. I carried on crying and moaning about my back pain, relieved that nothing was wrong as such, but not at all happy at the news that I was only 3cm. night-shift midwife would look after us. When the new midwife came in, at around 8pm, I was slightly surprised to meet… a man. A man who introduced himself as Willy John. So obviously The Husband didn’t bat an eyelid, and Willy John looked after us. 1) Seeing that I hadn’t eaten anything since lunch, I had to eat something. 2) Back-to- back labours are ‘the longest, most painful labours there are’ (his words, to the letter), so things would take a long while still. I had no idea what that was. He explained it’s an injection in the thigh, which provides pain relief for about 4 hours. There was no mention of any side-effects, and to be fair, neither of us asked. Ok, fine, let’s have it. I had the injection at around 9pm and soon started to feel the effects. It was the most surreal experience of my life. It was almost like an out-of- body experience. Lying on a mat on the floor on my side, I would scream during contractions and hear myself snore in between them. The Husband stayed with me for a bit, but following Willy John’s advice, he then headed out to get us some food. He came back with a lamb kebab (for himself), a chicken kebab, an apple and a chocolate bar for energy (for me). Sadly I wasn’t in the mood for a kebab, so after having my apple and my chocolate, I carried on with my out-of- body experience, talking complete nonsense and knowing it. I remember telling The Husband that his dad had gone for a haircut that day, knowing full well that that wasn’t true – I just wasn’t in control of what was going on with me! I’m telling you – honestly, the weirdest experience of my life. Come 1am, Willy John hadn’t been anywhere near us since giving me the injection. But around that time I started feeling the pain shift from my lower back towards my front, and I asked The Husband to go and find him. When he came in, he sent me to the toilet for a wee before examining me. I obviously was in no mood to get up, so he made a point of having a bit of a go at me for being too whiny. I somehow got the huge, in-labour, on-one- crutch-me to the toilet, I had my wee, and it looked like that was going on and on and on. “That’s not me”, I said to The Husband. My waters had most definitely gone now. Our baby boy finally joined us! When Willy John examined me, he was very surprised that I was now 8cm. I asked him if we could have the birth pool filled up, and he said there was no time for the pool. At that point, I got super excided. My baby was coming in less than 20 minutes??! He actually came after an hour or so, but what happened after this point felt extremely quick. I must say, compared to how painful the lower-back contractions during the long early labour had felt for me, the second stage felt like a walk in the park. I leaned forward onto a bean back, with The Husband and Willy John behind me. When transition hit I obviously starting crying and saying that I couldn’t do this, but Willy John wasn’t having any of it. And our first baby boy (now known on my blog as The Big Guy) was born at 2:13am on his due date, joining a small percentage of approx. 5% of babies who are born every year on their due date. We finally got to meet our little boy. I had been dying to know what he’d look like and couldn’t stop staring at him. After about half an hour, mild contractions started again, and the placenta was born. I then remember going for a shower, being stitched up a bit, and laying on the bed, with The Husband next to me and our baby boy sleeping next to us in his cot. I was on a natural high. So happy. I couldn’t sleep. I couldn’t stop staring at him. We must have managed an hour or so of sleep before the morning midwives came in at the start of their shift and came to meet our boy. Until one of the midwives came in asking whether Willy John had left something in the room. His name really was Willy John. And 3 years later, when we went back to the same room to have our second boy (The Middle Guy), our midwife Amanda told us that he really did exist and had moved to Australia. So Willy John will forever be the one who kept telling me off in labour, but most importantly, the one who helped us deliver our first baby boy. We won’t forget that in a hurry. What is also always remembered and mentioned about this story is that The Husband had two kebabs, and after so many months of me carrying my boy, he was the first one to see him. And that’s how our baby boy entered the world 8 years ago. That’s how I became Mamma and never looked back.